The year was 1916. World World I was raging in Europe, and the political climate in the United States was definitely guarded. Nine years earlier, President Theodore Roosevelt had initiated using classical design motifs for our gold coins, and now, as the Coinage Act of 1890 had authorized, it was time to change the smaller silver coins. U.S. Mint Chief Engraver Charles Barber's "uninspired" design had marked the quarter, dime and half dollar for the preceding quarter century, and the public was ready for something different. It was the perfect opportunity to issue a coin that, as a contemporary government report put it, "was intended to typify in a measure the awakening interest of the country to it's own protection." Thus, the Standing Liberty quarter was born. As was the case with the other new coinage, a competition was held to select the design. The artist chosen was a prominent sculptor of the day, Hermon Atkins MacNeil, who was known for his works dealing with Indians and American history, particularly on public buildings and monuments. MacNeil's obverse design features a standing, frontal view of Liberty, a portrayal reminiscent of ancient Greek sculpture. Her left arm is upraised, bearing a shield in a posture of protection. Being drawn from the shield by her right hand is a drapery, while this same hand offers up an olive branch. A mixed message certainly, but one that told our European neighbors we were ready for anything, war or peace. The inscription LIBERTY is at the top of the obverse, the date below, with the motto IN GOD WE TRUST flanking the figure of Liberty. The reverse of this type, as mandated by law, depicts an American eagle, here shown in full flight. The legend UNITED STATES OF AMERICA and motto E PLURIBUS UNUM are above, while the denomination QUARTER DOLLAR is below. The final product seems to reflect the influence of Augustus Saint-Gaudens, who was the most famous sculptor of the time and, some years earlier, a mentor for Mr. MacNeil. The first coins came off the presses December 16, 1916, and the series continued through 1930, during which time over 226 million coins were struck at three different mints: Philadelphia (no mintmark), San Francisco (S), and Denver (D). The mintmark can be found just to the left of the date, while the designer's initial M is to the right. No coins were struck in 1922, and no proofs were authorized, although several satin-finish proofs of 1916 and 1917 are reported to exist. There are two major subtypes of the Standing Liberty quarter, Type 1 and Type 2. Type 1 was issued for only two years, 1916-1917, as there was some concern over Liberty's bared breast. In 1917, the design was modified, and the offending feature was from then on covered with chain mail. Type 2, issued from 1917 through 1930, was substantially reworked, but the most evident changes were the repositioning of the stars on the reverse along with the chain mail on Miss Liberty mentioned earlier. Other, less obvious changes included a smoothing of the fields and a pronounced curvature to the dies. Both Type 1 and Type 2 quarters were produced by all three mints during 1917. The obverse also underwent a minor change beginning with the coinage of 1925, which some consider a subtype. The date was one of the higher features on earlier coins so that it wore off too rapidly. Circulated quarters of the 1917-24 period are consequently scarce with readable dates. To remedy this situation, the date area was recessed for all further coinage. As one of our most beautiful coin designs, the Standing Liberty quarter is very popular with collectors today. The series is collected in its entirety by date and mint or as part of a 20th Century type set. Unlike many other series, it is still possible to complete a full set in uncirculated condition-a valuable treasure that very few people will have the pleasure of owning. One of the key dates for the series is the issue dated 1916. With a mintage of only 52,000 pieces, it has always been sought by collectors. However, it does exist in larger numbers than one would expect. As with any new design, both collectors and the general public saved numerous examples. Original rolls, though expensive, were still available as late as the 1950s. The rarest Standing Liberty quarter is a Type 2 issue, the famous 1918/7-S overdate. Created when two differently dated hubs were used to prepare a single obverse die, the error was not discovered by numismatists until a number of years later, long after most of the coins had entered circulation. This coin is rare in all grades, but especially so in the higher ranges of mint state. The mintage figure for this interesting variety is unknown, but obviously miniscule. For years, one saw many otherwise complete sets that lacked only the overdate. It's literally one of the most desirable collector coins of the 20th Century. Other less rare but still challenging dates in high grade are 1920-S, 1926-S and the toughest date to find with a fully struck head on the Liberty figure, 1927-S. No coins in this series can actually be called common in gem condition, but 1917 Type 1 and 1930 quarters appear in full-head gem uncirculated condition most frequently. Many other issues are periodically available in gem condition, but not very often with a full head. When grading this design, the points to inspect carefully on the obverse are Liberty's right knee and the center of the shield. On the reverse, the eagle's breast and left wing will first show wear. Coins graded "full head" are much scarcer than those without this feature fully struck, but this classification has more to do with the quality of the strike than with grade. To qualify for this designation, the coin must exhibit the following three features: three leaves in Liberty's hair must be totally visible, the hairline along Liberty's brow must be complete and the ear indentation must be evident. Collectors will pay substantially more for these fully struck specimens. 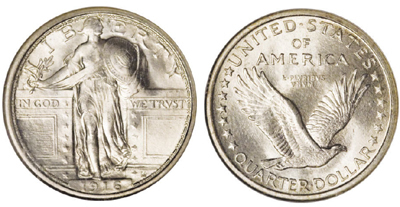 Only in production for fifteen years, the Standing Liberty quarter was to suffer an early demise. 1932 marked the 200th anniversary of George Washington's birth, and a new quarter dollar featuring his portrait was introduced as a circulating commemorative. Though no longer made in silver for circulation, the Washington quarter is still being minted today. BIBLIOGRAPHY: Bowers, Q. David, United States Dimes, Quarters and Half Dollars, Bowers and Merena Galleries, Wolfeboro, NH, 1986. Breen, Walter, Walter Breen's Complete Encyclopedia of U.S. and Colonial Coins, F.C.I./Doubleday, New York, 1988. Cline, J.H., Standing Liberty Quarters, 3rd Edition, J.H. Cline, Palm Harbor, FL, 1997. Vermeule, Cornelius, Numismatic Art in America, The Belknap Press of Harvard University Press, Cambridge, MA, 1971.